An identical local wet market in Hong Kong. I forgot the artist name but his works are definitely gorgeous! 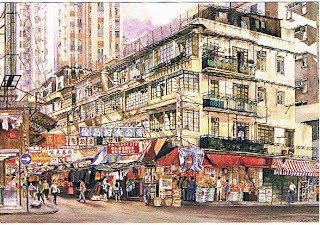 You still see these kinds of old buildings and wet market in Hong Kong nowadays. I think this painting may be depicting North Point in Hong Kong Island. You may like to wander around the North Point Market for some cheap products or fresh food.